For the first time since 2012, more U.S students took the SAT than the ACT last year. Almost two million students in the United States took the SAT in 2018. In comparison, 1.91 million took the ACT. The College Board, which owns the SAT, has pushed to expand its market share in recent years. The efforts have paid off. SAT prep classes are being held now at the Learning & Arts Center in Franklin Lakes. Call 201-84-STORM today to register! This entry was posted in Brain Food, BrainStorm’s resource center for parents. Sign up for our mailing list and receive a free e-book! 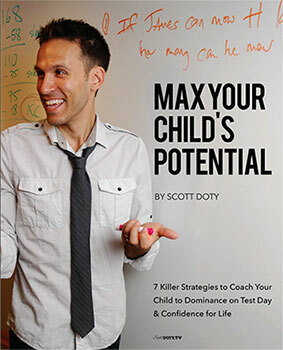 Written by BrainStorm's Chief Brainiac, CEO Scott Doty, "Max Your Child's Potential" details 7 strategies you can use to help your child score higher on SAT/ACT, get better grades in school, and to experience Dominance on Test Day, Confidence for Life. SAT® is a registered trademark of the College Board. ACT® is a registered trademark of ACT, Inc. Trademarks holders were not involved in the production of this product, do not endorse this product, and are not affiliated with BrainStorm Tutoring or this website.